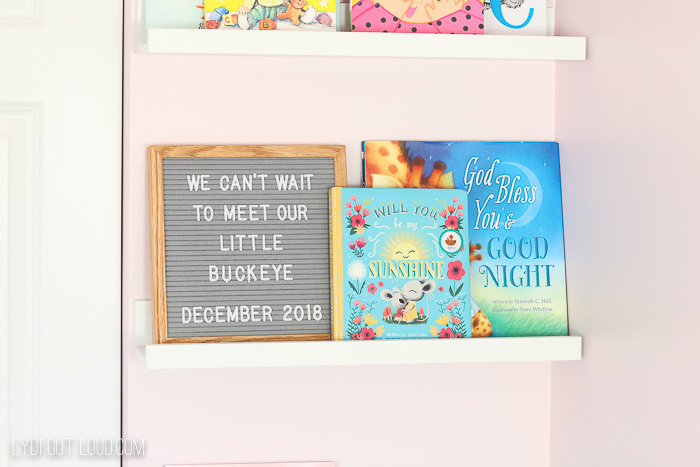 I veered a little off my original plan for this week after getting so many adorable stuffed animals and books… I decided I needed some cute nursery storage ideas that would display them rather than tossing them in a toy basket or on a bookshelf! Painters tape (Frog Tape is my fave because it’s so easy to remove and reposition while maintaining its tack. First I hung 3 of these Floating Picture Ledges . 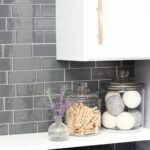 I used the 21 ¾” size but they also come in 45 ¼” if that better suits your space. 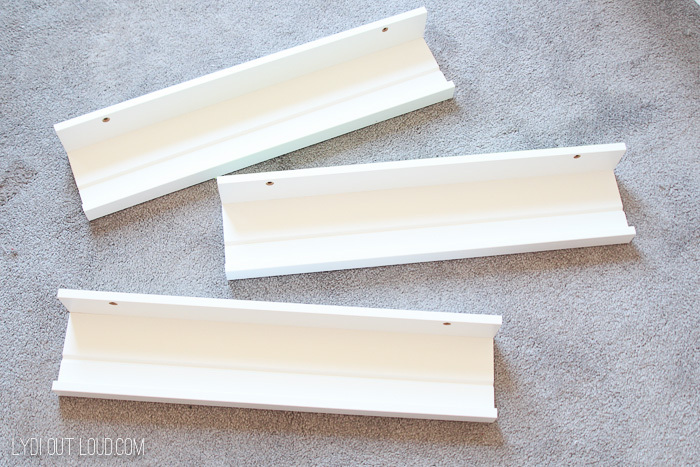 Here is my absolute favorite hack for hanging shelves, pictures or ANYTHING perfectly symmetrically every time. 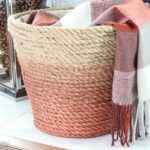 This hack saves so much time, frustration and drilling mistakes! 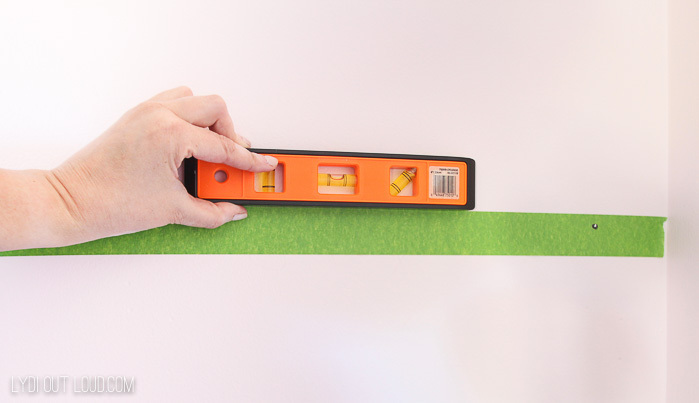 Place a piece of masking tape or painters tape across the entire width of the picture ledge, trimming at the edges so that it’s the exact width. Mark where the holes are with a sharpie. Since the holes are so close to the top on these shelves, I lined up the the top of the tape with the top edge of the shelf to make it even easier when you’re placing the tape on the wall to drill the holes. 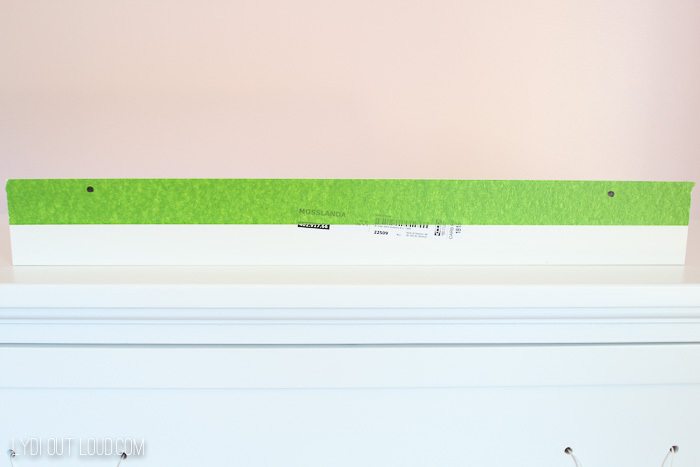 Next, remove the painters tape from the shelf and tape it to the wall where you will hang the shelf and ensure it’s level. 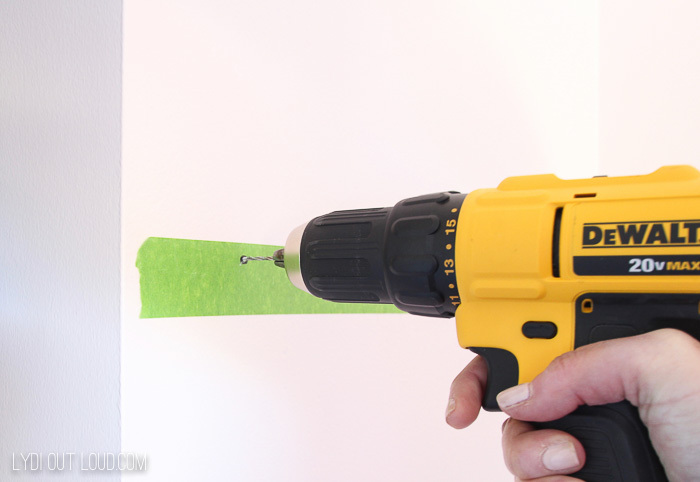 Drill small holes where the sharpie marks are and then screw in the shelf with wood screws or drywall anchors and screws. It’s that easy! Since I was hanging 3 shelves I used a measuring tape to measure the distance from the edge of the wall to the nail hole to make sure the shelves were even and I measured the distance from the top of the shelf to the top of the next shelf to make sure they were equidistance from each other and that’s where I lined up the tape. It was so fun to fill the shelves with some of the books we’ve received so far! If necessary, cut the dowel rod to the length of the picture ledge with a saw. 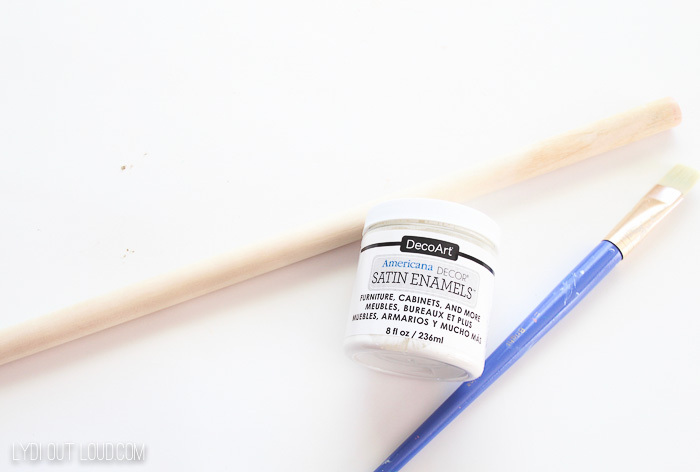 Paint the dowel rod with 2 coats white paint. 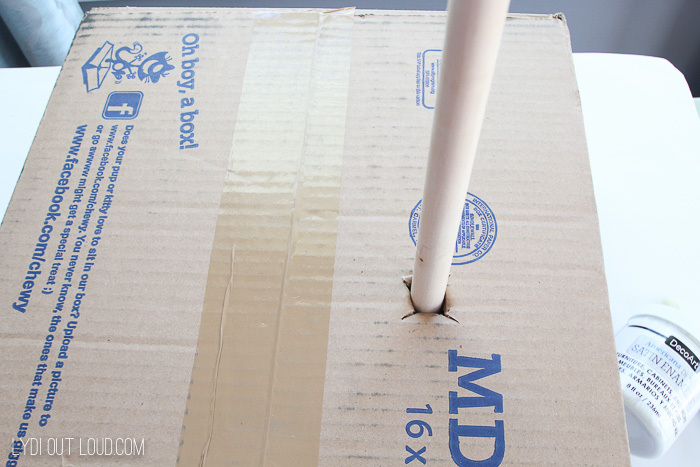 When painting any kind of rod or narrow cylindrical object, my favorite hack is the cut a criss cross shape in a shallow cardboard box just big enough to fit the rod and insert the rod into the hole so that I can paint all surfaces of the rod with it standing up. Once the top is painted and dry, I simply flip it over to paint the bottom half! Once the rod is dry, tie the rope around the end of the rod. 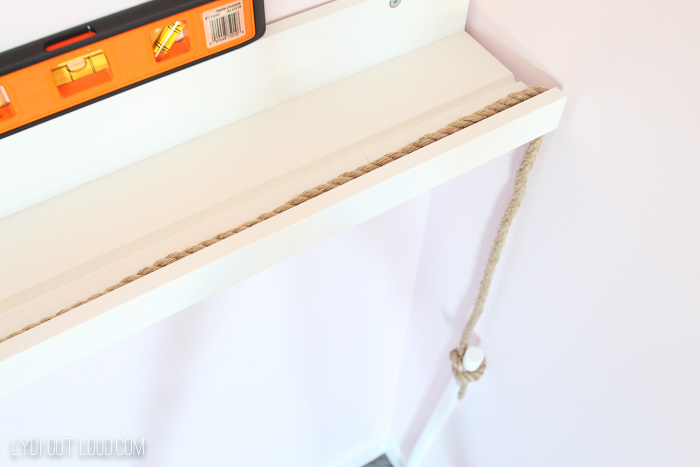 I decided to hang the stuffed animal swing from the bottom book ledge but it can easily be tacked to the wall too if you’d like it to stand alone. I slid the rope between the shelf and wall and down the other side. 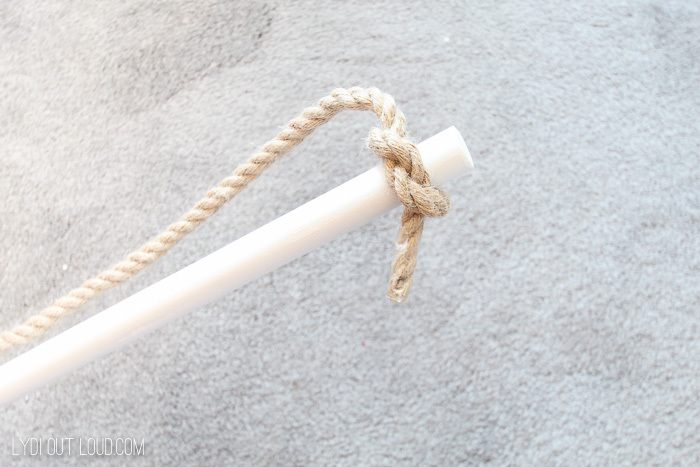 Tie the rope from the other side in a knot around the other end of the rod. When cutting rope, it’s a good idea to place some packing tape around the edge where you’ll be cutting to avoid fraying. 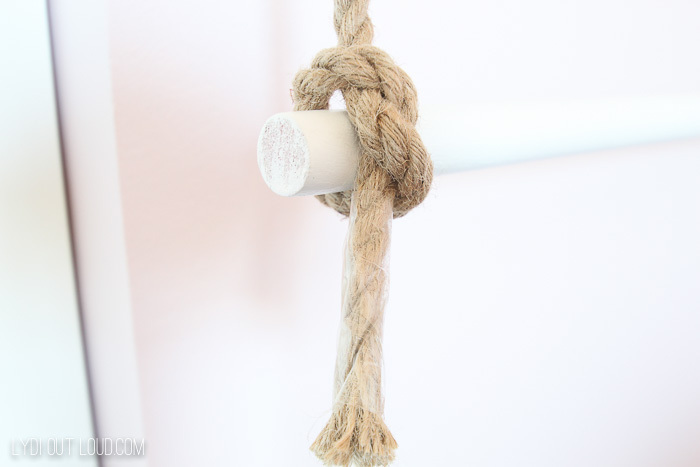 I secured the rope knots onto the dowel rod by adding a little bit of hot glue. 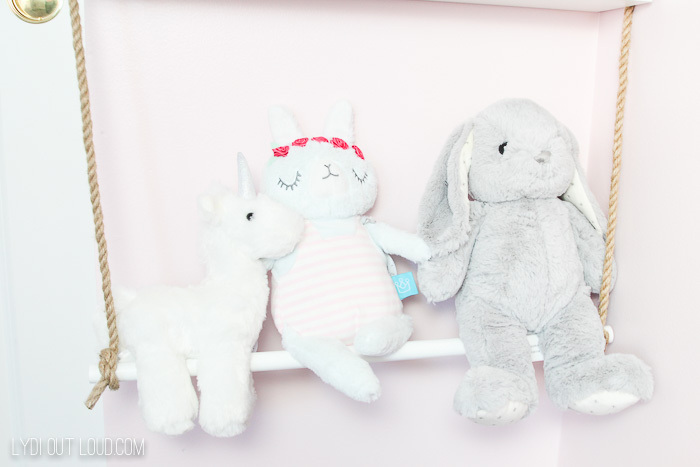 Now the beginning of our little girl’s stuffed animal collection is on beautiful display for us to enjoy! So week 3 is a wrap, 3 weeks to go until the grand reveal. I have a LOT to do, I hope you’ll stay tuned! This couldn’t be any cuter! What an adorable idea! Wow! What a amazing and clever idea! That project looks adorable! Super job! those friends sitting on the “swing” are just too cute. wish i had time to steal that for the nursery I’m working on for the ORC! LOL. 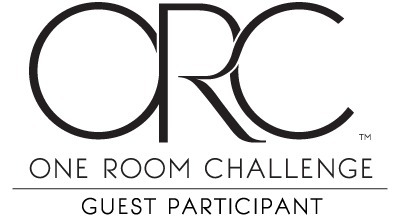 Can’t wait to see the entire room. The bookcase was cute enough but the swing with the animals . . . OMG! I love it! The room is looking fabulous! Can’t wait to see the rest of it! We have the same gray bunny, named (of course! ), “Bunny”. It’s my daughter’s favorite snuggle buddy.